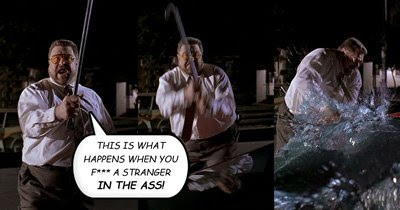 That's what I felt like doing to the car of the person who schedules the Oscar movies in Singapore. But I wouldn't know who that person is, or even know where to begin to find his car. Furthermore, I don't plan on going to jail for it, so I'll have to be contented with Walter doing the deed on my behalf. If you're not following, then you must have missed my earlier posts about the near-impossible task of watching the Oscar-nominated movies especially if you're car-less and live and work at least 25 minutes away from the city. The movies are rarely ever shown outside the city, and often scheduled during working hours or very near to closing time, leaving not much time for travelling. Late shows are out of the question because the buses and MRT stop services right before a late show ends. The price of living far from the city = $12.50 or 42% above weekday prices, suckers! Also, last Monday's Evangelion 1.0 : You Are (Not) Alone ticket fare = $8.50! Why? One, the cinema that's showing it increased their fares recently. Two, the movie is exclusive to this cinema. Three, therefore every single Evangelion fan in Singapore will be bottlenecked to the only two cinemas showing it, thus guaranteeing that seats will be unavailable. Price for booking a seat in advance = add. $1. To see the complete BMF Budget, click here.